Fork-tailed Flycatcher is a vagrant that ABA Area birders unashamedly lust for. This bird was photographed a few years ago in Connecticut, by Corey Finger. Recently a Fork-tailed Flycatcher was reported from a park in San Francisco, a long ways away from its home in Central and South America. This is not only a MEGAVAGRANT, it is also an absolute CRIPPLER and hard to misidentify on top of that. However, let us not forget (and I certainly won’t let you) that I am the Overlord Ornithologist, Undisputed Champion Birder Of The World. I know birders just as well as I know birds, and I was not ready to put all my faith in this fantastic sighting. Sure enough, the bird’s true identity became known the next day. It was not a flycatcher at all, but an exotic (and equally bizarre) from Africa, which certainly escaped from someone’s cage or perhaps even migrated from the small breeding population of escapees in southern California. 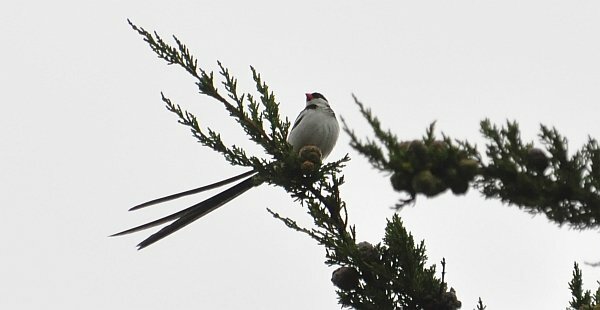 Pin-tailed Whydah at Sutro Heights Park, San Francisco, CA. Superficially similar to Fork-tailed Flycatcher, especially if you don’t know that this species exists! The original observer had the grace to admit to the blown call (something many birders could learn from), and many local birders were more than happy to see the equally strange-looking whydah the next day. However, I think this incident is a good wake up call for many birders: our country is being invaded by alien birds, and if you want to continue to be sharp, you need to keep up with them. Most of these birds are escaped/freed pets who have established breeding populations, and many of these populations are growing; others could be falconer’s birds, or part of a zoo or private collection. So unprepared were local birders for Pin-tailed Whydah, some of them openly questioned the species’ very existence on the local listserv. This is not a situation you want to find yourself in. Whydahs have been known further south in California for a number of years, and have (unsurprisingly) also been misidentified for Fork-tailed Flycatcher down there. Whydahs aside, birders nationwide should keep an eye out for other suspicious finch-like birds like Orange Bishop and Nutmeg Mannakin, not to mention a whole host of parrots and parakeets that are gaining a foothold in many parts of the country. Birding the border area of San Diego, CA, my colleague Seagull Steve almost had a brain aneurysm when confronted with a female White-collared Seedeater earlier in the year. This was not a species he was prepared to be looking at so far from its normal range; it is one of several Mexican “cage species” that seem to be getting established in the area. In due time, more invaders will be upon us, and field guides will always lag behind! I’m sure many birders were completely stumped the first time a Eurasian Collared-Dove flopped down in front of them…birders must stay in a state of constant readiness, or else it will just be a matter of time before a Fork-tailed Flycatcher/Pin-tailed Whydah debacle happens to you. We should not only know our rarities, we should know our alien invaders. It may be difficult to stay ahead of the invasion, but I assure you…The Truth Is Out There. Well, according the the greenhouse gatekeeper, it really was a Superb Starling, but they didn’t say how it happened to be there. As always, the most important birder in the world provides us with the most important posts. Only knowing the birds in your field guide is a huuuuuuge problem. Think Accipiter – if you see an Accipiter in north America, you ask yourself if it is goshawk, Coop or Sharpie. That’s mostly done by size and general proportions. Once you reach e.g. Sharpie, you look no further. But why is it not a vagrant Euro Sparrowhawk, or Japanese Sparrowhawk, or some other migrating East Asian Accipiter? Seriously. Start with 26 Sep: @ 15:27:22 (wish there was a better link for that but the Siler-style looks like it’s about to scroll off momentarily). “whydah” is beyond the pale. Sounds like some society of cognoscenti. Seriously, those posts made my day. Good times on listservs. More inadvertent comedy than one could ever expect. My birdclub has a secret handshake and a magic decoder ring, don’t know about you guys.